Glenroy is an Imperial Blade and a bodyguard of the Emperor during the game's tutorial. 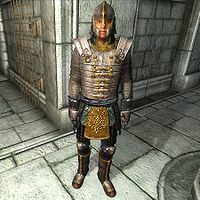 Glenroy wears a set of Blades armor that cannot be looted. He is armed with his Akaviri katana, which will be retrieved by Baurus upon his death if you don't take it. He also carries a small amount of gold. When you first meet Glenroy, he will be following his captain into your prison cell. She will berate him when they find the cell occupied: "What's this prisoner doing here? This cell is supposed to be off-limits." He will try to excuse himself: "Usual mixup with the Watch, I ..." before she cuts him off. To make up for it, he will waste no time in asserting his authority: "You! Prisoner! Stand aside. Over by the window. Stay out of the way, and you won't get hurt." If you don't do so quickly enough, he will say, "Prisoner! Stand away from the door! Over by the window, now!" If you still refuse to do as directed, he will continuously repeat, "Prisoner! Get over by the window, now!" until you do. He will then walk into your cell and say, "Stay put, prisoner." At this point, speaking to him shows how he thinks of you as a bystander to the situation: "This is official business. Do not interfere." When Captain Renault dies, Glenroy will panic: "The captain's down!" After the messy fight, Glenroy will ask, "How could they be waiting for us here?" Baurus will respond, "Don't know. But it's too late to go back now." Glenroy will reassure him, "They won't be the first to underestimate the Blades." He will continue with: "I'll take point. Let's move." When you meet up with them for a second time, Glenroy will begin getting worried: "We should find a defensible spot and protect the Emperor until help arrives." After the brief Mythic Dawn attack, if you don't come down off the ledge for him to acknowledge you, he may tell the Emperor to move on using one of the following lines: "Sire, we have to go now." or "Your Majesty, we need to keep moving." or "Please, sire. We can't stay here. We have to go." When you reveal your presence, Glenroy will angrily say, "Dammit, it's that prisoner again! Kill him/her, he/she might be working with the assassins." After you have selected your birthsign, landing a killing blow on an assassin may or may not change his tone, as he may tell you, "You handled yourself pretty well back there. Just keep out of our way, got it?" Glenroy has two different greetings, depending on the stage of the tutorial:[verification needed — which stage?] "The Emperor may trust you, but I don't. Stay out of our way." or "Maybe the Emperor is right about you. The best way you can help is to let us do our jobs and don't get in our way." He will also reprimand you for striking him, although after the third attack he will initiate combat: "Don't push me, prisoner. ", "You don't want to do that again. ", "I'm out of patience with you, prisoner!" If he attacks, you must either yield or knock him unconscious. When in the final room, just before you head down the last of the stairs, Glenroy will call to Baurus: "Hold up. I don't like this. Let me take a look." Upon getting a little closer, he will say, "Looks clear. Come on. We're almost through to the sewers." When he finds out the gate is barred from the other side, he will get cross: "Dammit! The gate is barred from the other side. A trap!" When Baurus mentions a side passage they've passed, Glenroy will repond, "Worth a try. Let's go!" When at the end of the side passage in a dead end room, if you don't head in straight away to force a dialogue change, Baurus may say to Glenroy, "It's a dead end. What's your call, sir?" Glenroy will reply, "I don't know. I don't see any good options here." After a short while, he will be alarmed and say: "They're behind us! Wait here, sire." and "Here they come again!" After Baurus has told you to stay with the Emperor, he and Glenroy will storm off to kill the assassins and may yell: "For the Emperor!" Glenroy will meet his end in this battle, as he is scripted to die no matter how the fight goes. When fighting an enemy, he may say: "Watch your back, Baurus!" Before you leave the prison for the sewers Baurus will take his and Captain Renault's katanas, if you possess them, and thank you for retrieving them: "By the way, thanks for recovering Glenroy's sword/my comrades' swords. I'll see that it is/they are given a place of honor in the halls of the Blades." Tutorial: You must follow the secret escape route to escape the prison. Although for the majority of the tutorial he will simply be rendered unconscious if you beat him in combat, he loses his Essential status during the final fight and can be killed by your hand if you neglect to guard the Emperor. Doing so will not earn you a bounty, but it will attract the attention of the Dark Brotherhood. Esta página foi modificada pela última vez à(s) 05h28min de 20 de outubro de 2015.